Picture this: you're out for a walk around your neighborhood when you see a dog trotting down the sidewalk by himself. The stray dog seems friendly and well-behaved, but he is obviously away from his home. You want to help reunite him with his owner, but you're not sure where to begin. First, consider your own safety. Lost animals can be frightened, sick, or injured, and may not respond the way a happy, healthy pet would. Approach a stray dog with caution, moving slowly so as to not startle him. Talk softly and soothingly, and perhaps offer him a treat to entice him. If something about the dog seems threatening or unsafe, do not attempt to restrain or approach him. Return home and call Animal Control officials to report the stray dog in your neighborhood. If the dog allows you to approach and seems friendly, check to see if he is wearing a collar with an identifying tag. If so, great! ID tags will make it much easier to reunite the pet with his owner. If not, don't despair. Many animals have microchip identification that can help them get back home if they become lost. But how do you get the dog to a shelter or vet's office to have him scanned for a microchip? 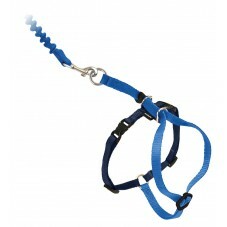 First, gently restrain him with a leash, carrier, even a piece of rope in lieu of a leash. If possible, enlist the help of a friend or family member to catch and transport the dog. Don't attempt to transport him unrestrained in your car, as he may become frightened and act erratically, potentially causing an accident or lodging himself in an area so tightly that it becomes difficult to extract him. Now is the time to ask yourself some important questions: What is your goal in rescuing the pet? Are you willing to keep the animal if he can't be reunited with his owner? Are you willing to provide a temporary home until his previous home--or a new home--can be found? If the dog has injuries, are you willing to pay for any veterinary care? Many times animal shelters do not have the funds to cover expensive surgeries or treatments. Be honest with yourself about your ability to provide a home or finances for the dog's care. With the stray dog safely restrained in a carrier or other car transport device in your car, decide where you plan to take him. You can take him immediately to your local animal shelter, where the staff can scan him for a microchip. You can take him to your veterinarian, where the staff can examine the dog for injuries and also scan him for a microchip. Or you can take him home first. If you decide to take him home before contacting an animal shelter or your vet, be sure to keep him away from your other pets. After all, you don't know the dog's history, including if he is aggressive with other animals or currently ill.
To help find the dog's home, take his picture and create fliers to post in the neighborhood where you found him. Include your contact information and a thorough description of the dog, and include the date and time you found him. Post some of the fliers at your local vet's office, and let your local animal shelter know about the dog in case someone checks there for a lost pet. You can also post notices on animal websites such as petfinder.com. Call your local animal shelters to see if anyone is searching for an animal that matches the dog's description. You may also want to call other veterinary offices to ask the same question. In the end, keep in mind that some stray animals are just that--strays without owners. Be prepared to either surrender the dog to your local animal shelter or find it a good home--who knows, that home may just be yours!